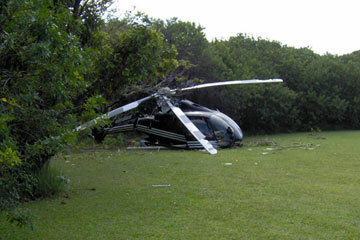 A chartered helicopter made a hard landing yesterday in a private residential lot on Maui, damaging the aircraft. WAILUKU » A chartered helicopter made a hard landing yesterday in a private residential lot on Maui, damaging the aircraft substantially, Federal Aviation Administration officials said. There were no serious injuries to the five passengers and a pilot -- all of whom underwent a precautionary examination at Maui Memorial Medical Center, authorities said. Maui artist Al Schwartz, who lives at 3127 Baldwin Ave., said the helicopter came down near the edge of his property and landed mainly in bushes of a lot belonging to Beverly and Joe Gannon, owners of the Hailiimaile Restaurant. "I ran over there to see if I could help, and I saw the people were OK. ... It was amazing it landed right side up," Schwartz said. "Basically, everyone got out on their own ability." Schwartz said the helicopter that made the hard landing was the second aircraft to take off from a nearby property to go to Kapalua. The first helicopter left successfully after clearing some trees, he said. The incident took place at 3:51 p.m. yesterday near Baldwin Avenue, about one-eighth of a mile mauka of the Montessori of Maui school, authorities said. The helicopter took off from a private residence and went up about 75 to 100 feet before it began descending and made a hard landing in a neighbor's yard, said Bruce Nelson, the FAA operations officer in Los Angeles. Nelson said the cause of the hard landing by the Sunshine Helicopters craft was under investigation. Sunshine Helicopters was unavailable for comment.